Bulk SMS Nigeria Text Message @ 76kobo per SMS I Instant Delivery Guaranteed. Buy Bulk SMS Text Message Online In Nigeria @ 76kobo per SMS unit and Enjoy Immediate Delivery. 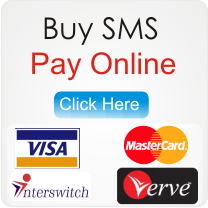 We provide affordable & most reliable Bulk SMS Service in Nigeria. Bulk SMS Nigeria I Bulk SMS Service I Bulk SMS in Nigeria. Bulk SMS Service has become a significant marketing and campaign tool to promote business as it creates awareness about a brand and also helps in reaching a large potential market i.e a reasonable number of clients within a short period. Our Bulk SMS in Nigeria Service will help you to achieve your advertising plan and strategy, increases your client retention and ensure a better client and staff relationship with your organization. Bulk SMS Nigeria Service at Adeb Global Solutions is highly dependable as the network coverage is sound and wide and disseminate to the whole country at large. Using our bulk sms service will help you Stay connected with clients in this fast moving period of modern day at a very reasonable and affordable cost. Due to the effectiveness and affordability, most companies have adopted the use of our Bulk SMS Service as a campaign tool to promote\market their products or services. We provide effective, outstanding and reliable bulk SMS service which ensure immediate and timely delivery of bulk SMS messages at the cheapest rates. However, sending bulk SMS messages call for the sender to use a much more familiar name that will ring bell immediately your recipient open your text message. This name will be entered in the SENDER I.D COLUMN which will be seen immediately you click on COMPOSE SMS tab. Your sender ID might be the name of your website, business, church, organization, institution etc depends on the name you want your recipients to identify you with but make sure that the name is not more than eleven characters or instead you can make use of the abbreviations provided you have a longer identification name. Please note that Microsoft Word and Microsoft Excel are not Joomla friendly. Therefore, make sure that you type both recipients' numbers and the exact text message directly on the compose page or use NOTEPAD to type everything. Then copy them and paste each of them in the appropriate box. Also, note that your RECIPIENT NUMBERS must be separated with the use of comma(,) to ensure perfect delivery. However, the USE OF GSM NUMBER as sender I.D is highly prohibited. Please be informed that to avoid failing or pending transactions on VOGUEPAY, you need to ensure that the cards being used for payments are 3D authentication enable. The 3D authentication is a security check on cards that enables the card holder to OTP during the process of payment. This is to protect card holders against unauthorized card usage by external body. However, you are strongly advised to run a test on your bulk SMS account by sending SMS to your personal GSM number before sending out to your clients in order to confirm the acceptance of your SENDER I.D and also confirm the status of the network whether it is safe to use or otherwise. Also, you can send bulk SMS to all GSM and CDMA networks across Nigeria and 620 networks in 180 countries across the globe. We assure you of international standard bulk SMS service. The SMS you buy from us will remain in your SMS account as long as you have not exhausted it because our SMS does not expire, irrespective of the duration. Endeavour to open a bulk SMS account on our bulk SMS portal today and start enjoying the most reliable bulk SMS services in Nigeria. You will automatically receive 2 free SMS in your SMS account which you can use to test the quality of our bulk SMS service immediately after a successful registration before you decide to make bulk SMS purchase. Excellent and Quality Service is our watch word. 4) Then, locate NOTEPAD and click on it. 1) Register a FREE bulk SMS user account on this bulk SMS website (registration is absolutely free on all the bulk SMS portals in the world). 2) Log on to your newly created bulk SMS user account with your username and password. 3) Make use of the free SMS in your newly created account to test our bulk SMS website by sending text message to one of your own GSM numbers. 4) Once you are satisfied with the test you conducted through free SMS given to you, the next thing is to buy bulk SMS in volume which depends on the quantity needed. You can log out and take steps towards making payment for the quantity of your choice. 5) After making payment and your bulk SMS account is credited, Log on to your bulk SMS account with your USERNAME and PASSWORD, and click on "COMPOSE MESSAGE". 6) Enter the sender ID which must not be longer than 11 characters. Also type in or paste the recipients number(s) in the space for recipients. The next thing to do here is to compose the message which you want to send to your recipients. 7) The final step to take is to click on "SEND" and the message will be delivered to all your recipients within few seconds.